Recent release “Peace Journey” from Page Publishing author Julius Salik discusses his determination to be mindful of the sense of deprivation of the members from his constituency. He, as a token of attachment and sense of belonging, has voluntarily adopted a simple way of living and started wearing khaki, which, in the subcontinent, stands for a sign of humility and self-sacrifice. 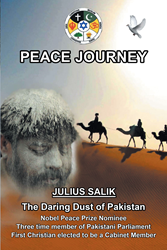 Julius Salik, whose political career spans nearly two decades, has completed his new book “Peace Journey”: an intriguing work detailing the author’s nineteen long years (since 1977 to date) of tireless political struggle on various levels in sociohumanitarian fields. In recognition of his services, he was elected from the position of a local councillor to that of a federal minister in charge of population welfare, a coveted, prestigious, and superior position of public responsibility in the government of Pakistan. Published by New York City-based Page Publishing, Julius Salik’s inspirational work details how he was born in a modest Christian family of Lahore (Pakistan). Salik has an inborn impulse to live and serve others and work for sectarian forward undauntedly as a line crusader against despotism and tyranny. He has raised his voice for the cause of love and peace for all irrespective of caste, creed, and color. As a member of Parliament representing a constituency of the whole of the Christian community of Pakistan, he has won the distinction, the love, and the respect of all Pakistanis. Mr. Salik’s political career spans nearly two decades. He has served his constituents both at the local and national level, having been continuously elected by the Christian community of Pakistan five times in the past—thrice as member of, established a record of scoring the highest number of votes in representing the downtrodden classes of the people and fighting zealously for the solution of their problems at home and abroad, most effectively bringing relief of the suffering humanity. Readers who wish to experience this inspirational story can purchase “Peace Journey” at bookstores everywhere, or online at the Apple iTunes store, Amazon, Google Play or Barnes and Noble. Page Publishing is a traditional New York based full-service publishing house that handles all of the intricacies involved in publishing its authors’ books, including distribution in the world’s largest retail outlets and royalty generation. Page Publishing knows that authors need to be free to create - not bogged down with complicated business issues like eBook conversion, establishing wholesale accounts, shipping, taxes and the like. Its roster of authors can leave behind these tedious, complex and time consuming issues, and focus on their passion: writing and creating. Learn more at http://www.pagepublishing.com.